Alpacas have a lifespan of about 20 years. Alpacas stand about 1 metre tall at the withers (the highest part of the animal’s back). Cria, the young, weigh about 6 to 8kg at birth. Adult females weigh between 45 and 65kg, some males can be slightly larger. Do they get many illnesses? Alpacas are hardy and relatively problem free. However, like all livestock they can suffer from various diseases and may at times require veterinary treatment. They require vaccinations yearly and also regular worming. Alpacas are semi-ruminants, surviving happily on grass throughout the year. Hay must be provided on an ad lib basis all year round – particularly in the winter. Most owners provide a low protein supplementary feed which usually includes additional minerals and nutrients. A grazing regime of between 3-5 per acre is usual, but will depend on your conditions. How long is their gestation? Alpacas have a gestation of about 11 months, but this can vary. They give birth to a cria (young animal) that weighs about 6 to 8kg. Female alpacas tend to give birth in the morning. They rarely have twins but, if they do, it is unusual for the cria to survive. The cria is weaned at about 6 months of age. Are alpacas difficult to breed? 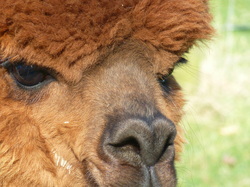 Alpacas are induced ovulators and therefore can be bred at any time, although planning for spring births is preferable. The females are generally remated 2-6 weeks after the birth. Males become fertile at about 18 months to 3 years. To ensure successful breeding programmes, only the most outstanding males should be kept back for stud work. Do they need special shelter or fencing? Alpacas need a field shelter, large enough to house all of the alpacas in the field, to allow them to get out of the rain. Alpacas do not challenge fences and so a metre high barrier is adequate. Barbed wire and electric tape should be removed because their wool can get tangled in it and they can become trapped. Do they affect the pasture? Alpacas are very gentle on the land because they have padded feet and therefore do not churn up the ground. They deposit their droppings in piles in only a few sites and cleaning up is easier than for other animals. Alpacas are easy to transport in any covered trailer or horse box. They tend to sit down on the journey. Can alpacas be kept on their own? No, alpacas are a herd animal and will become stressed if kept alone even for short periods. They should be kept in groups of three or more. Alpacas can be run with other animals such as goats and sheep and provide good protection from foxes, and with horses with a dividing fence between them. Are alpacas easy to handle? Alpacas are gentle and easy if handled calmly and correctly. They can be halter trained very easily, especially when young. They occasionally spit but only when provoked such as when they are being vaccinated. Some will kick when being touched on their back legs but, if handled when young, they can be desensitised in this area. How often do they need shearing? Huacaya Alpacas need shearing once a year, although suris are sometimes sheared every other year. On average, a fleece will weigh between 2 and 5 kg but some alpacas have the potential to produce more. What colours can alpacas be? There are five main colour groups - white, fawn, brown, grey and black, with many different variations within each shade. 22 shades of fleece or fibre are recognised worldwide for production of yarn. Alpacas make excellent pets. They are intelligent, easily trained and are usually very gentle with children. They are inquisitive, approaching people who stand and watch them. They will eat out of the hand if time is spent and training to lead by a halter is straightforward. Yes, alpaca forms part of the food chain in South America. It is a very lean meat with a low cholesterol and low fat content. There are some members in the UK who offer alpaca meat and meat products for sale. Where should I go to buy alpacas? You should come to us to purchase your alpacas! Seriously, we strongly recommend that purchasers visit breeders and see their animals and how they keep them. We also advise that you only purchase BAS registered alpacas - their owners should be following the BAS Code of Conduct for the Sale of Alpacas.